I did not follow the Presidential race/inauguration/early days very closely, but I did hear a few things that made me think about the generational aspects of President Obama. Leading up to the inauguration there were many references to former presidents, particularly FDR and Abraham Lincoln. There are some similarities between Obama, FDR and Lincoln, but they have little to do with leadership style. The similarities are in the character of the time that they came into power. The Fourth Turning is a Crisis. Society is challenged by a massive crisis that requires everyone pull together to survive. An example of this is the Great Depression and WWII, 1929-1946. We are in a Crisis turning now as well (started in about 2005) and will probably remain so until about 2025 when it will come to a climax. The colors represent the archetypes of each generation, Yellow for Hero (GI Generation, Millennials), Green for Nomads (Lost, Gen X), Blue for Prophet (Missionary, Boomer) and Orange for Artist (Progressive, Silent). On the far left is the founding of the nation with George Washington as president, and on the far right is the current day, extrapolating Obama out for four years. I have more detailed versions of this data that I will put up in a future post, but this diagram gives an overview of the presidential generations through our brief history. There are lots of things you might pick up from this chart, but if you look for the crisis periods (1940’s and 1860’s, WWII and Civil Wars respectively), you will see the previous two have mainly blue bars, meaning they were Prophet Generations (Lincoln and FDR). 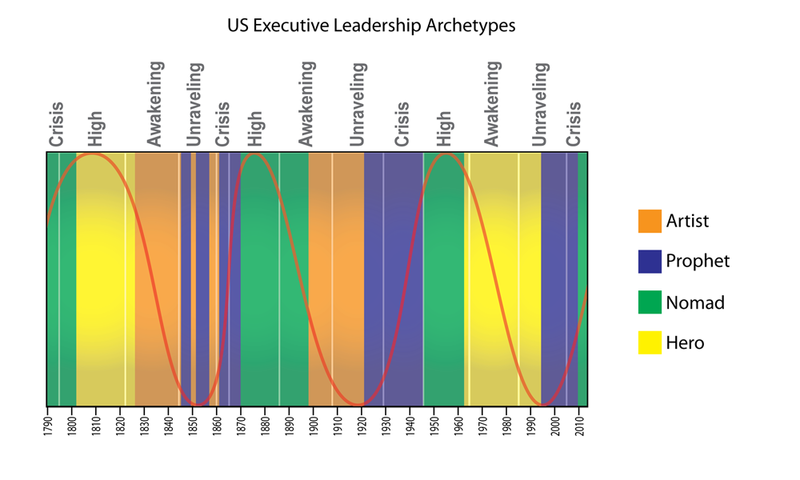 The previous crisis was The American Revolution (way over on the left side of the chart) and it had a green (Nomad) leader: George Washington. 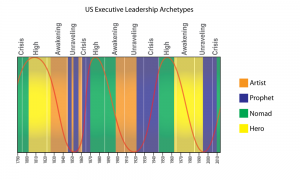 So who does Obama most resemble in terms of generational character combined with social cycle? He is Generation X, which is a Nomad generation (green in the chart), leading during a crisis. The last time we saw that combination was our first president, George Washington, a Nomad leader during the crisis (American Revolution). What does this mean for his potential in office? Having a practical leader who pushes getting things done during a national crisis is something our country has not seen in over 200 years. I may examine that in a future post. Tufte! I’m blushing. I will definitely have more on this topic, mainly in the form of an Excel table that goes into more detail. I need to think about how to present that, probably as a google doc, maybe with a screencast to explain it. Nicely presented. It’s important to bear in mind that Strauss and Howe’s work is still very much a minority opinion. The mid-1960s, especially 1965, remain the far more commonly used start point for GenX. Many nationally influential voices have said that Obama is part of Generation Jones, born 1954-1965, between the Boomers and Generation X. Google Generation Jones, and you’ll see it’s gotten a lot of media attention, and many top commentators from many top publications and networks (Washington Post, Time magazine, NBC, Newsweek, ABC, etc.) specifically use this term to describe Obama, born in 1961, as part of Generation Jones. Thanks for the comment. I could use some help in understanding Generation Jones. I agree that it seems to be a popular designation right now, but I am not sure if I see the value of this meme. The advantage of how Strauss and Howe interpret generations is that their theories have some PREDICTIVE value. Although it may be frustrating for many to be lumped in with 20 years worth of people, when combined with the turnings, these designations give a good understanding of where the country is going. I am not sure if the same can be said for Generation Jones, the PC generation, Net Generation and all the other smaller cohorts that are described by other theories. My question is: what does the existence of Generation Jones add to our predictive understanding of events? Although a finer grained breakdown of generations and turnings certainly could exist, just naming another generation doesn’t help the overall picture. If there are actually 6 or 8 generations per cycle, I am fine with that, but what does that say about the attitudes that will prevail 10, 20, 50 or 100 years from now? Strauss and Howe’s works are interesting to me because of that predictive power. The marketing push behind Generation Jones – online – has been on full-force since Obama entered the White House. As someone who studies cultural studies as a part of her scholastic work, I do not see the theoretical grounding for Pontell's construction. It contradicts Raymond William's idea of a "structure of feeling" without offering a firmly grounded theory of its own. It's devoid of any connection to cultural studies whatsoever; it has, however, been heavily marketed online by word of mouth. The problem with Generation Jones is that it's ahistorical. In other words, Pontell cherry-picked specific habits and perspectives and constructed an artificial "generation" despite events in history. Structures of feeling occur because generations respond to their world culturally as historical events shape their world. Boomers responded to a world following WW2 in which a strong American consumer developed – hence the teen culture. The same occurred with the GI Generation who, coming of age after WW1, felt a strong obligation to fight for their nation during WW2. Pontell discusses nothing of historical value that shaped the world of "Generation Jones." He only refers to people who are too young or too old to remember certain events, which by itself does not historicize the concept. For this reason, Strauss and Howe never conceived of a "Generation Jones" – because no historical events occurred to usher in a tiny 10-year generation between two actual generations – Boomers and X'ers. What I see occurring here, though, is a dramatic, and somewhat emotive, drive to capture positive symbols to substantiate "Generation Jones" – such as Barack Obama. Being trapped between two generations – and adopting the structures of feeling of both – is a natural occurrence that has happened between generations since the dawn of modern civilization. It's nothing new, so for this reason, I'm puzzled by Pontell's need to construct this particular shift between the Boomers and the X'ers into a "generation." I do wonder if this has been self-motivated, perhaps influenced by the heightened marketing attention granted to generations during the 20th Century. Does he think these are the first American generations? But otherwise, I can't support it, and I know a few other scholars who also can't support it. @Christina, great comment. I am going to make this a topic for an upcoming post. Hope you don't mind if I quote your comment. I find it interesting how the War of 1812 occured during a high according to that chart. I guess that the best analogy for that would be the Korean War and the anti-communist hysteria of the 1050s. Although the war of 1812 seems to me to be a mini crises era in itself. I also find the comparison of Obama to George Washington to be interesting, especially since during Washington's presidency the country was not involved in any large scale fighting but was still in a crises era. Maybe that is the type of crises era that we will find ourselves engulfed in this time. @joey – Yes, I think that the ware of 1812 was considered a minor war, like Korea (or even Vietnam). Those wars spark more conflict and further dissension in the society rather than bringing it together (like the wars during crisis eras). The timing (as you point out) of the crisis during Washington's presidency is very different than now. We are at the start of a crisis now and Washington's reign came at the end of the Revolutionary crisis. But he is still the only other example of a Nomad governing during a crisis. BTW, I deleted your other comment which looked like a duplicate. It's cool, I didn't mean to duplicate. I’m wondering how you think about these subjects now, after 8 years of President Obama, and now 2 years into the age of Trump?